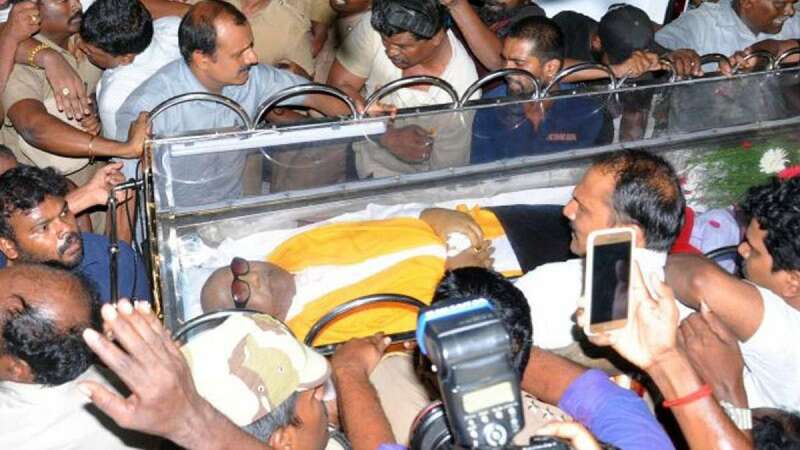 Chennai : The Madras High Court on Wednesday granted permission to bury late DMK President and former Tamil Nadu Chief Minister M. Karunanidhi on the Marina Beach here after rejecting state government's denial of DMK's plea. Acting Chief Justice Huluvadi G. Ramesh and Justice S.S. Sundar passed the order after hearing counsel for DMK and the government which said granting permission would violate environmental laws and rules on protection of Marina Beach. DMK leader and lawyer Kannadasan told reporters that the court also asked the government to make arrangements for the burial. As the news of the court's decision broke out in Rajaji Hall where Karunanidhi's body was lying in state, an emotional DMK Working President M.K. Stalin broke down only to be comforted by top party leaders Duraimurugan, A. Raja and others. Former Union Minister Dayanidhi Maran, grand nephew of Karunanidhi and Kanimozhi, the former Chief Minister's daughter, also gave Stalin an emotional hug on hearing the news.